The people's rally at Williams Park took place while the Jim Crow mayoral debates were presented to an invitation-only audience. No issue is a greater taboo in the bourgeois electoral arena than the demand for reparations to the African community. A politician’s position on reparations to the black community is the litmus test they must pass to be approved by the ruling elite as legitimate contenders in a bourgeois electoral contest. Chairman Omali Yeshitela explains that elections under bourgeois democracy function as nothing but a nonviolent contest between competing sectors of the ruling class for control of the state. When Obama ran for president the first time, he was the first candidate to say he was opposed to reparations for black people, assuring the ruling class that he would be a reliable neocolonial puppet. When the self-described socialist Bernie Sanders ran for president, despite all his bluster about revolution, he made it loud and clear early on in the campaign that reparations was not something he would ever consider. It is for this reason that it was all the more groundbreaking that the Uhuru Movement ran two candidates in the 2017 St. Petersburg local elections who did more than simply mention reparations; it was the basis for their entire platform. Based on the brilliant strategy engineered by Chairman Omali Yeshitela and the African People’s Socialist Party (APSP), reparations, police violence, black economics, and gentrification were not only mentioned in the St. Pete election, but pushed to the center of the discussion in a massive and popular campaign that garnered national and even international media coverage. 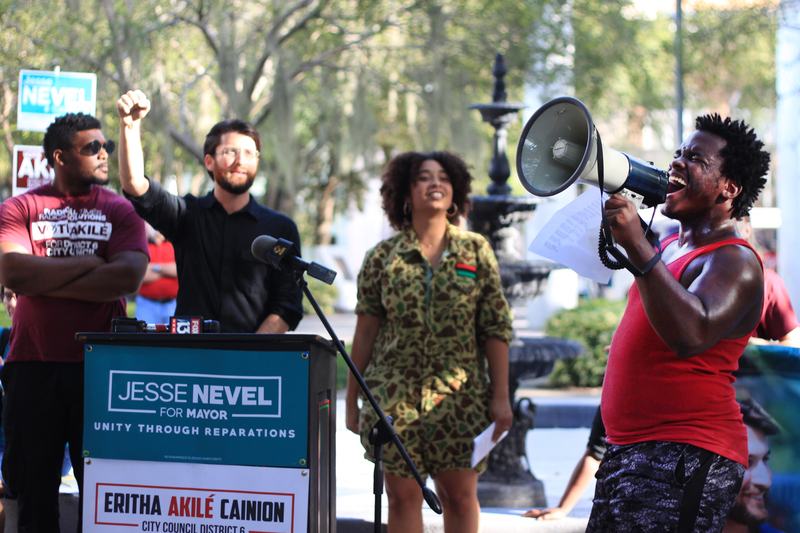 The campaigns of Akilé Anai (formerly known as Eritha Akilé Cainion) and Jesse Nevel for District 6 councilwoman and mayor, backed by an energetic, youthful people’s movement, forced the interests and aspirations of the black working class onto the agenda at every debate and forum. Akilé and Jesse operated from a platform shaped by the theory of African Internationalism and based specifically on the 19-Point Platform of Black National Self-determination put forward by the Black is Back Coalition for Social Justice, Peace and Reparations, a coalition in which the APSP plays a leading role. This progressive, anti-colonial platform fused with the concrete demands of black workers and other progressive forces in St. Petersburg, Florida to give birth to the 10-point and 20-point platforms of Akilé and Jesse’s campaigns. Platform points like the call for a five-year moratorium on high-rise construction and the creation of workers’ councils in the water resources department were influenced by meetings with city workers and community members whose lives were impacted by the disastrous policies of the current administration. The platform truly belonged to the people’s movement, with Akilé and Jesse as their ambassadors. From the very first debate, where Akilé boldly strode to the microphone and proclaimed that she was not interested in reforming the status quo but in overturning it, the bourgeoisie’s boundaries for the discussion had been shattered into a million tiny little pieces. The power of Akilé’s words and the passion of her delivery, punctuated by the exuberant cheers of the audience, drained the color from the faces of her opponents, a ghastly menagerie of gentrifiers and political opportunists. The impact of this campaign in changing the narrative was so profound that the ruling class media blocked Jesse from participating in the only televised debate during the election cycle, broadcast and co-sponsored by the Tampa Bay Times, Bay News 9, and St. Petersburg College. This exclusion of the Uhuru candidate from the debate was such an obvious frontal assault in the war of ideas that even St. Petersburg College withdrew their sponsorship in an unprecedented move. Despite their best efforts to impose an information quarantine on the Akilé/Jesse campaign, the movement inspired national and international coverage. Akilé was profiled in Ebony magazine, which printed an interview with her laying out her platform of black political and economic empowerment. Numerous articles in the local press, Creative Loafing and Tampa Bay Business Journal in particular, documented the impact of the message of unity through reparations. Although Creative Loafing published an endorsement of Kriseman, nearly half the endorsement article was spent defending their decisions against the obvious progressive alternative, Jesse. Even the reactionary Tampa Bay Times, the staunchest enemy of the campaign and the people, was forced to admit, after the infamous Hilton debate, that the “Uhurus” deserved credit for raising issues that would normally not get any air time in a St. Pete election. The movement did not rely on the bourgeois media to keep our platform out there, however. We held weekly Sunday rallies, sponsored by the International People’s Democratic Uhuru Movement (InPDUM) and its local president Liu Montsho Kwayera, held in the heart of the south side at the beautiful Akwaaba Hall. The rallies dealt with all of the issues on the platform including gentrification, workers’ rights, the sewage crisis, disparities faced by gender and sexuality-nonconforming Africans despite gains achieved by the white LGBT community, public education, public safety and more. The campaign also held three town hall meetings at churches throughout St. Pete on the issues of the sewage system, gentrification and reparations. We held nearly twenty press conferences and engaged in a blistering schedule of daily on-the-ground outreach. These served not simply to drum up votes but to win unity with the platform. “Like Mr. Kriseman, I was born into a Jewish family. When we bring up the question of reparations to the black community, questions arise. “How? To whom? How much? But everyone knows what my family and Mr. Kriseman’s family went through at the hands of Nazi Germany, and everyone knows our people, the Jewish people, received reparations from the German government, and nobody asked those questions when the Jews got reparations for the wrongs committed against us. “So when you look at the conditions of black people in this city where there is a holocaust museum for my people, but we can’t even acknowledge the terror, the poverty, the misery faced by the black community, the question that every one of us needs to answer tonight, is if reparations is okay for the Jewish community, then why would it not be okay for the black community? This question was repeated at forums, rallies and press conferences, including at one held at the Holocaust Museum following a brutal murder of three black teens by the Sheriff’s department in Palm harbor. The dividing line of the campaign was where the candidates stood on the question of justice for Dominique Battle, Ashaunti Butler, and La’Niyah Miller, the three teenaged girls murdered by the Sheriff’s Department. Because of Akilé in particular, who chairs the 3DBG Committee, their names were brought up at every debate. During the first forum held at the Uhuru House entitled “What about the black community?” two neocolonial candidates viciously attacked the girls and their mother, Kunde Mwamvita, uniting with the sheriff’s and media’s vilification of the African community. It was Kunde, Akilé, and the Uhuru Movement who stood unconditionally on the side of African youth and who refused to perpetuate slanderous notions that Africans are the poster children of crime in St. Petersburg. Rather, Akilé and Jesse insisted, they are the victims of crime, theft and colonial murder. Akilé’s defense of African children was the key dividing line in the District 6 race, the question which most starkly separated her from the rest of the candidates who were all in bed with the white nationalist killing machine known as the Sheriff’s Department and the St. Petersburg police. Finally, the fate of the Tropicana Field, a baseball stadium constructed on the ruins of St. Petersburg’s oldest black neighborhood after the city destroyed it, was brought into the discussion by Akilé and Jesse. The city government is looking at possibly turning this 85-acre site into a shopping mall or furthering their aims of gentrification, but Akilé and Jesse put forth the people’s demand that the Tropicana stadium land be returned to the black community for the use of economic development and affordable housing, a concrete example of reparations on a municipal level. Such a plan, Akilé and Jesse argued, would take pressure off the housing market for the entire city, an example of how a public policy of reparations is in the interests of all of St. Pete’s residents, including white people. The other capitalist candidates, Kriseman and Baker, were forced to pretend at times that they agreed with this idea. Even one of the white gentrifiers in District 6 tried to steal this platform point during the debate at the Hilton. The power of the platform cannot be measured in the number of votes we got or how many press conferences, forums and rallies we held. White people who met the Uhuru Movement through this campaign expressed that their lives were changed and their hope in the future of humanity restored, bringing overwhelming happiness. One hot afternoon in late July when Akilé knocked on the door of a black working class family in District 6, an African woman opened the door and after listening to Akilé’s message, tears began to stream down her face. She told Akilé that she’d just moved into her house after living out of a Ford explorer with her six children, and that she was so moved to see someone finally fighting for her interests. That was the power of the people’s platform. Now, though the election is over, the struggle continues in the work to build upon this platform and consolidate the vehicle through which its aims and objectives can be achieved: Communities United for Reparations and Economic Development (CURED).